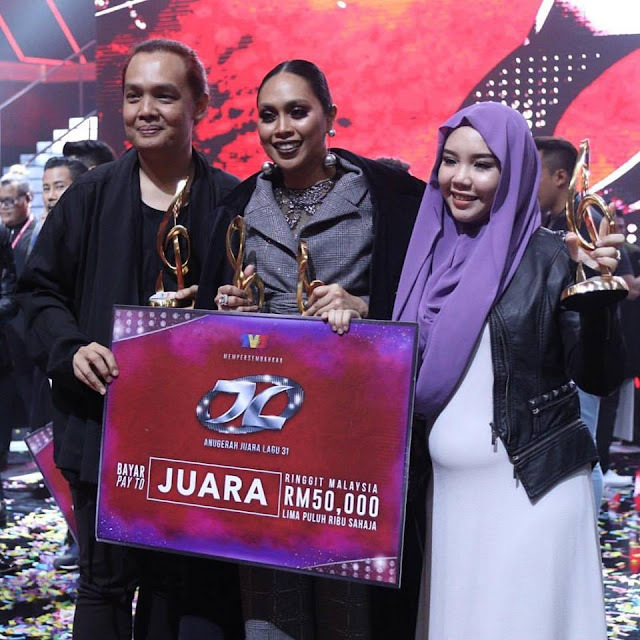 Dayang Nurfaizah has won Malaysia’s annual music competition “Anugerah Juara Lagu” (Champion of Song Awards), with her song “Lelaki Teragung” (Greatest Man) composed by Natasha and written by Iman Imran. The 35-year-old singer not only walked away with a trophy, but also a RM50,000 cash prize along with vouchers from CJ Wow Shop. Apart from winning the grand prize, Dayang also won Best Vocalist, receiving another trophy as well as a RM12,000 cash prize, making it a total of RM62,000. Coming in at second place is Hafiz and Misha Omar for their song, “Terimaku Seadanya”, written and composed by Ajai, while the third place was won by The Projector Band for “Sudah Ku Tahu”. The 1st and 2nd runner-ups also took home trophies along with RM35,000 and RM20,000 cash prizes respectively, while the fan-voted category for Best Performance went to Khalifah for “Hang Pi Mana”, who also took home a trophy and a RM12,000 cash prize. This is Dayang’s first time as the big winner of Anugerah Juara Lagu. Last night, the Sarawakian singer dedicated the song to the recently departed Sarawak’s Chief Minister Tan Sri Adenan Satem who always supported her as well as many other Sarawakian artistes.